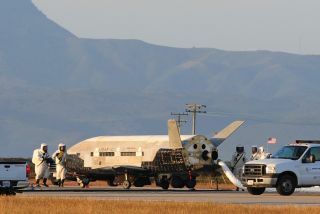 Air Force Launching Secretive X-37B Space Plane in October, Could Land in Fla.
Technicians inspect the military X37-B space plane after its June 2012 landing, which completed the vehicle's second trip to orbit. The U.S. military's hush-hush robotic X-37B space plane is slated to blast off again next month, Air Force officials say. The mission will test the robotic spacecraft's reusability and may eventually land on the Florida runway once used for NASA space shuttles. The X-37B space plane's next mission — called Orbital Test Vehicle-3, or OTV-3, because it is the program's third-ever spaceflight — is scheduled to launch aboard an Atlas 5 rocket from Florida's Cape Canaveral Air Force Station (CCAFS) sometime in October. "Preparations for launch at Cape Canaveral have begun," said Major Tracy Bunko at the Pentagon’s Air Force press desk. "We are on track to launch OTV-3 next month; however, the exact date remains subject to change based on range conditions, weather, etc." The U.S. Air Force's X-37B Orbital Test Vehicle is shown inside its payload fairing during encapsulation at the Astrotech facility in Titusville, Fla., ahead of a planned April 2010 launch from Cape Canaveral Air Force Station in Florida. Bunko said in an earlier communiqué that this third flight will use the same X-37B spacecraft that flew the first test flight, the OTV-1 mission, back in 2010. That maiden voyage of the miniature space plane lasted 225 days. It launched into orbit on April 22, 2010, and then landed on Dec. 3 of that year, zooming in on autopilot over the Pacific Ocean and gliding down onto a specially prepared runway at Vandenberg Air Force Base in California. A different X-37B vehicle made a similar Vandenberg touchdown this past June 16, having stayed in orbit for 469 days on its OTV-2 mission. The X-37B program is being run by the U.S. Air Force Rapid Capabilities Office. The two space planes — which are 29 feet (8.8 meters) long and 15 feet (4.5 m) wide, with a payload bay about the size of a pickup truck bed — were built by Boeing Government Space Systems. While they're sparing with details about the X-37B program, Air Force officials say the vehicles enable them to test out how new technologies perform in space. While both previous X-37B missions touched down at Vandenberg, the Air Force is considering landing future flights at NASA's Kennedy Space Center in Florida, next door to the Cape Canaveral launch site. In fact, the Air Force is currently conducting taxi and braking tests as part of an ongoing appraisal. The prospect of a returning the robotic space plane to the KSC landing strip — which was used by NASA's now-retired space shuttle fleet — is seen as a cost-saving measure. "We are also considering consolidating landing, refurbishment and launch operations at KSC or CCAFS in an effort to save money," Bunko said. “We are seeking to leverage previous space shuttle investments and are investigating the possibility of using the former shuttle infrastructure for X-37B OTV landing operations," Bunko added. "Those investigations are in an early state, and any specifics will not be known for some time, but could potentially be used as early as for the landing of OTV-3."